Hi. My name is Tania Marsh and, for the past nine year, I have been Deputy Manager at the NCAC. I love my job. It is different every day. Here I am pictured with nine-year-old Maisie. She was a Cumbrian flood victim who was found trapped in her flooded house and rescued completely soaking wet! She endured a bit of a journey on the rescue boat but it took her three days to settle and become her normal charming self. She is gentle and affectionate and loves to escape from her pen, when given the opportunity, and head straight for the food cupboard. She's a loving and clever girl. My role involves supporting the manager in the day to day running of the centre, liasing with the staff and planning the workload of the day. There will be cats being collected to go home, so final health checks need to be done before they leave and any flea and worm treatment need applying, claws to be clipped and fur groomed. There will be cats arriving, too. The amount differs from day to day, but there will be anything up to ten in any one day, and the team needs to organise which wing the cat will go to on arrival. Prior to this they need to have their initial health check to ascertain if they need to see the vet immediately. All the team have received training on how to perform this, and it involves doing a nose to tail examination, looking for any issues or concerns, taking their arrival weight, issuing flea and worm treatment and microchipping those cats that are not already microchipped - apart from stray cats who have a two week hold on this to ascertain if there is an owner first. My involvement in this is to make sure that the team know what part they will be playing in the arrival and departure of these cats. There will be cats who will be sitting in the bottom wings of the centre, of which there are four: Admissions, Family, Maternity and Isolation. These cats will be receiving their final health checks by the vet, after recovery from an operation or coming to the end of a medication course, to be declared fit to home. I need to make sure that it has been organised for them to move from these wings up to the homing wings, of which we have three, for their opportunity to be seen by the visiting public and reserved with a view to a full adoption. There will be queries from the visitors that I need to deal with, queries on the telephone and also emails. Currently I am running through organisational plans for our annual fundraising event, a Summer Fun Day. It is our most popular event of the year and always sees over 1,000 visitors to the NCAC just on that one day, which is thrilling. One week in three I get to work in close contact with the veterinary team. This involves making appointments for the vet to see a cat after arriving at the centre, to do a first veterinary examination, start their vaccination course, issue any medication required, book the cat in for any operations it may need at the on-site clinic. 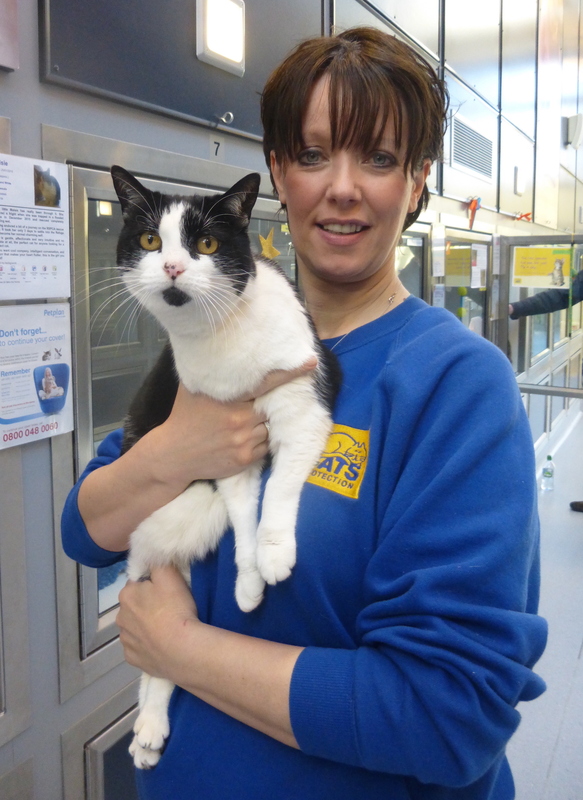 As we are the largest centre in the Cats Protection nationwide organization we need to have our own clinic. Whereas the other centres and branches will be dealing with their local high street vet and taking their cats to them for check ups and procedures, the NCAC is too large a centre and holding too many cats for this to be practical. I will be making appointments for the vets to perform check ups on cats already here, especially when a concern comes through from a cat care assistant that they may have spotted: a symptom, a behaviour or an issue that they feel needs veterinary attention. I will be making sure any medication that is prescribed for a cat is discharged to them, and that they have their appointment booked in for a check up at the end of the course to see how treatment is progressing. I will als make sure that any cats that are booked in for an operation at the clinic the next day have their basket outside their pen ready for safe transportation to the clinic, and that they have had their last meal removed from their pen, so the vet can be confident that they have not eaten anything overnight. I will then need to make sure that the team have set the returning cats pens to bed rest, for the cats to safely recover, which means that their cat flap is blocked off so they cannot use it, as this gives them access to their back run with a ladder that takes them down to the floor. This would be unsafe for a cat after a general anaesthetic, when judgement could still be impaired and we would not want to run the risk of accident or injury. Therefore, they will need to have their litter tray and water bowl placed inside overnight so they have full access to all their amenities. Working with the vets is the most enjoyable part of my role, as I have learnt so much about cats and about veterinary procedures and medication and what its used for. This is invaluable to me, and a useful background knowledge when caring for my own three cats at home. From time to time I still get chance to get back to my very first Cats Protection roots, when I started as a cat care assistant, and I get to help out in the wings to feed, clean, medicate , and record observations etc. Being a deputy manager means that a lot of the hands-on work with the cats has taken a back seat with me, because of the nature of my role, so it can be an added bonus to work with the vet team as I can get up close with the cats - albeit on a vet table.